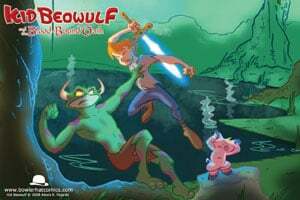 “Kid Beowulf” – A New Graphic Novel for Kids! With all the rather questionable children’s “literature” (at least what passes for it now) out there, it’s refreshing to see a new take on the much beloved comic book that is fun, age appropriate and educational. WIN! The Kid Beowulf series by Alexis E. Fajardo is inspired by the Anglo-Saxon poem, Beowulf. It’s a children’s graphic novel that details the adventures of Kid Beowulf with Grendel – not as enemies, but as twin brothers. They travel together and meet other historical figures such as El Cid and Roland. The themes are mainly medieval but there are a few stories that take place during ancient times. This series is a great way for parents to introduce their children to classic medieval and ancient works through fun, bright and colourful stories. What in particular interested you in making a cartoon superhero out of the Beowulf story? Kid Beowulf is really a mash-up of two of my great loves: comics and the classics. I grew up reading all sorts of mythology and I supplemented that with a healthy dose of comic strips, so doing a project where those worlds collided was second nature! Would you prefer to keep the series mainly set in the Middle Ages or will Kid Beowulf explore other periods in history. Kid Beowulf is the story of 12-year-old twin brothers, Beowulf and Grendel, and their adventures across distant lands and mythologies. Each book in the series is inspired by a different country and its epic poem. Book 1 is inspired by Beowulf and is the origin story of the brothers, book two takes them to France and The Song of Roland, and book three brings them to Spain and El Cid. So the first trilogy is very much set in the middle ages, but I plan to take the brothers into Italy, Greece, Mesopotamia and beyond, using such epics as The Odyssey, The Iliad and Gilgamesh to name just a few. The over-arching story is the maturation of the brothers and the discovery of their true destiny, which is to one day fight each other as foretold in the original Beowulf. I see my books as prequels of sorts and hopefully I can point folks back to the original epics to see how the stories end. What made you decide to undertake a children’s graphic novel versus making Beowulf a more adult comic since this would have allowed you to pursue darker themes? For me, Kid Beowulf is all about making these great epics as accessible as possible to as wide a readership as possible; so using a cartoony approach helps because kids are drawn to the pictures, but I try to keep the subject matter as true to the source material as I can. I have no intention of defanging the epics–those darker themes are what makes them so compelling and why they continue to be retold centuries later and why kids and adults respond to those themes. The challenge is in crafting a story that is a fun and engaging adventure but still has the heft and emotional weight of the epics they are based on. Aside from Kid Beowulf, are you currently working on any other graphic novel projects? I’m lucky enough to be a part of the Charles M. Schulz Studio in Santa Rosa California, where the licensing for PEANUTS is done. I work on a variety of publishing projects, from reprint collections to new material; it’s a fun and challenging position and I always discover something new everyday, not unlike when I reread Beowulf!